Easy Cake recipe by Maher Nigar at PakiRecipes.com. Mix flour and baking soda in a bowl with salt , keep aside. In another bowl beat eggs, oil, milk, sugar and now constantly stir. Add the flour mix in it slowly...keep mixing untill it forms a paste, now add water until it makes a paste out of it . Put this batter in an oil greased tray and in a preheated oven 350F. 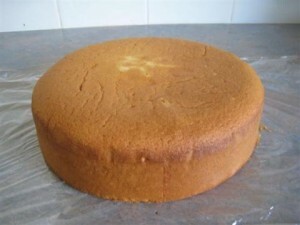 Bake for thirty minutes to check that whether it is cooked or not, insert a knife in the cake and take it out if its sticky its not cooked, if its clean its ready. how you dont know about this recipe?